The company was originated by Rene Paradis who has over 30 years of experience. Beginning on the shop floor as a vocational welding student, Rene progressed through shop foreman and project management, to general manager, to partner, and ultimately to ownership. As an active contributor, he has learned all aspects of the business from the ground up. Rene has established a reputation that causes clients to reach out to him time and time again. Our philosophy is that integrity matters; beginning with an honest estimate and culminating with getting the job done on schedule. Sharing expertise throughout the process with design, assistance with materials and finishes, value engineering, and creative problem solving has proven as a valuable asset for our clients. Our goal is to exceed your expectations from start to finish. All of our work is custom, which keeps us both interested and challenged. We value our diverse workload with projects of various sizes and requirements. 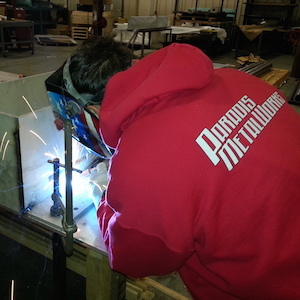 Paradis MetalWorks can manage the entire scope of a project; design assistance, 3-D modeling, detailing, engineering, fabrication, finishing, and installation. We look forward to collaborating with you on your project.